Antidepressants are a medication commonly used to treat individuals struggling with symptoms of depression. Some of these symptoms include lack of interest, fatigue, hopelessness, sadness, and even suicidal thoughts. The decision to take an antidepressant, engage in outpatient psychological therapy, or combine the two is entirely up to the individual and their needs. If you and your doctor have decided it may be best to begin taking an antidepressant medication, you may feel afraid and have a lot of questions. Below I have addressed some common concerns people may have when they begin taking medication to treat their depression or anxiety. Many people believe that when they begin to take antidepressants, they will start feeling better within a day or even an hour of taking their first pill. Unlike many medications, antidepressants take a while to kick in. According to the U.S. Food and Drug Administration (2017), you may start to feel better within one to three weeks of starting an antidepressant, but it can take six to eight weeks to feel the full effect. The first relief you or your loved ones may notice is that you cry less frequently, or the little things don’t bother you as much anymore. Eventually, you begin to enjoy activities you neglected and feel more like yourself. The purpose of antidepressants is not to make you “happy” or inhibit you from feeling your emotions. They are not sedatives, stimulants, or tranquilizers, and they are not habit-forming. However, an article on WebMD, written by Brenda Conaway (2010) states that antidepressants are designed to alter a chemical imbalance in your brain to maintain your standard level of functioning. Once you begin taking the medication, within two to four weeks, you will begin to experience typical levels of a full range of emotions including joy, sadness, and many others. Antidepressants affect people in different ways depending on the medication, dosage, and severity of their symptoms. According to the FDA (2017), minor side effects include a headache, nausea, dizziness, sweating, diarrhea, and tremors. More serious side effects include worry, panic, sleeplessness, fatigue, loss of libido, and weight gain. In very rare cases, people taking antidepressants may experience an increase in suicidal thoughts and are reminded to go to the emergency room if this occurs. 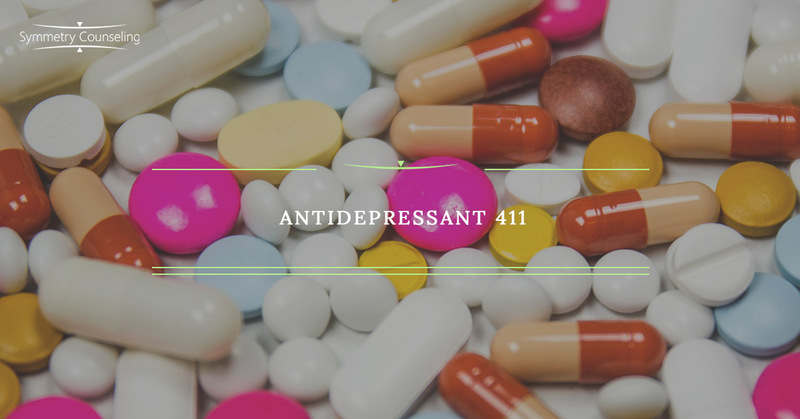 It is very important when you begin taking antidepressant medication to be aware of how your body is reacting to it and to consult with your doctor when necessary. How Often Do You Take Them and For How Long? There is no shame in seeking help whether it be medication, therapy, or both. If you are currently experiencing symptoms of depression and would like support, it may be useful to connect with a therapist. Contact Symmetry Counseling to set up an appointment with one of our very talented therapists at one of our two Chicago locations.